With AMDs recent release of their APUs it was only a matter of time before the technology came to small factor computers. In the past, you needed a Motherboard, CPU, and GPU (either discrete or integrated into the motherboard) to have a working system. However with the E-350 this is all rolled into one miniscule package. 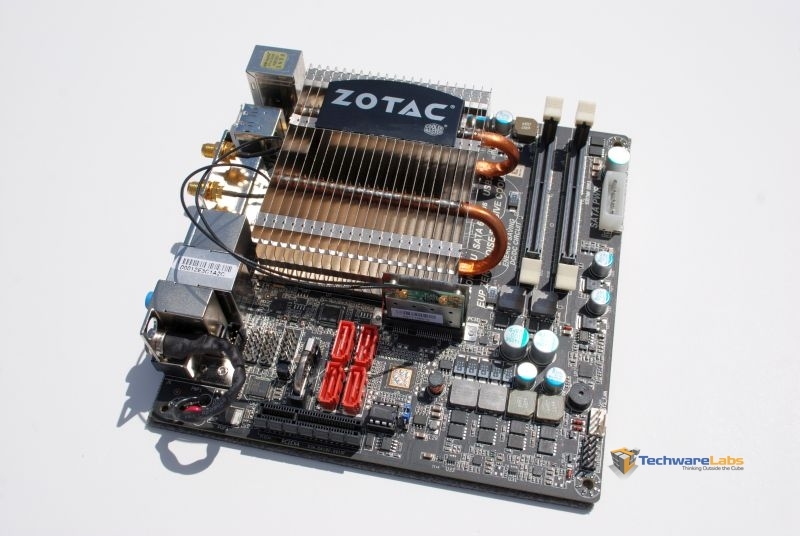 Today we will be looking at a slightly different solution called the Zotac Fusion-B-U. Experience premium energy-efficiency computing and world-class graphics processing with the ZOTAC FUSION-ITX WiFi series powered by the AMD E-350 APU Platform. The ZOTAC FUSION-ITX WiFi series pairs a dual-core processor and AMD Radeon™ HD 6310 Discrete-Class Graphics processor for an outstanding synergy of CPU and GPU performance capable of stunning Microsoft® DirectX® 11 graphics, high-definition Blu-ray playback, streaming high-definition Internet video and day-to-day computing tasks while sipping miniscule amounts of energy. Already we see where Zotac is aiming with this “All-in-one” solution: DirectX 11, HD Blu-Ray Playback, Streaming HD internet video, and day-to-day computing tasks. The fact that this board runs solely on a 90w power brick makes it all the more interesting. Lets move forward to see if Zotac has hit their mark.